The Models 6015 WA and 6111 WA, pressure sensitive labeling systems for applying labels to cylindrical containers, are designed as economy wrap-around systems to provide solutions for applications requiring full or partial wraps. Label-Aire Inc.6015 WA and 6111 WA, pressure sensitive labeling systems for applying labels to cylindrical containers, are designed as economy wrap-around systems to provide solutions for applications requiring full or partial wraps. The 6015 WA features the Model 2015 wipe-on labeling head while the 6111 WA utilizes the Model 2111 air blow labeling head. As the product travels along the 6' long conveyor, it is separated by a single metering wheel. When it reaches the labeling station, the label is synchronously dispensed onto the product at the same speed it is traveling on the conveyor. With the 6111 WA, the label is dispensed onto a vacuum grid and tacked onto the leading edge of the product. 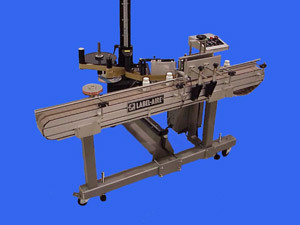 With the label now in position, on both systems, the label wrap is completed when a 6" x 12" wrap belt spins the product and completes the smooth lay down of the label. Candidate applications for these systems include vitamin containers, pharmaceutical vial applications, boston rounds and virtually any other cylindrical products requiring a label. , 550 Burning Tree Rd., Fullerton, CA 92833. Tel: 714-441-0700; Fax: 714-526-0300.